You are here: Jake's Bones > Why do so many deer get hit by cars ? It is still very wintery here in Scotland which makes it difficult to drive or even walk about without slipping over. If you're a deer, it's very tough. To find food you might have to search new areas, and that can mean crossing roads and getting run over. 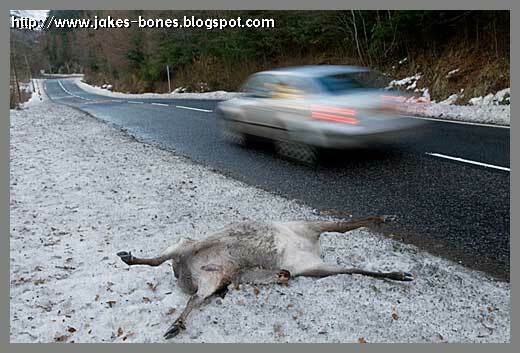 On Thursday my dad was driving up to the mountains when he saw this dead red deer hind on the road. It had been hit so hard that its neck broke and bent underneath it. Every year, somewhere between 45,000 to 70,000 deer get killed by cars which is huge. I've seen lots of deer at the side of the road where they've been hit. My friend Krissy told me there was even one just outside my village a few days ago. Even though lots of deer get killed on the roads in the winter, May and October are the worst times for deer getting killed. In May, the year-old deer get chased away by their parents and have to find their own place to live. That means they end up crossing roads, or living in a dangerous area. In October and November, the red deer come off the hills and move to the woods at night, and that means they sometimes have to cross roads. Late evening and early morning are the most dangerous times, because this is when deer like to move about. Two of my skeletons were deer that were killed in car accidents. 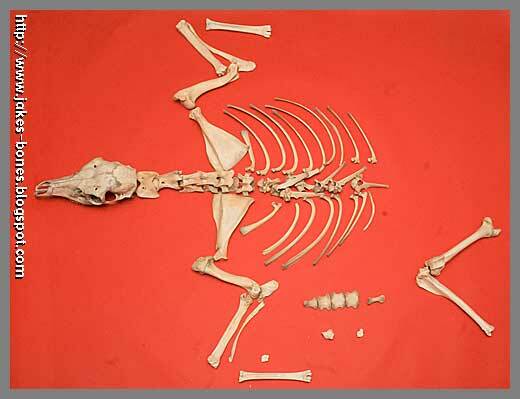 ↑ This skeleton is called Bert, and he is a baby roe deer that I found in April 2009. He was a very young baby, and because roe deer are born in May, he must have died the previous year, maybe in June or July 2008. I found the skeleton next to a road that runs from my village to the Gleneagles hotel. 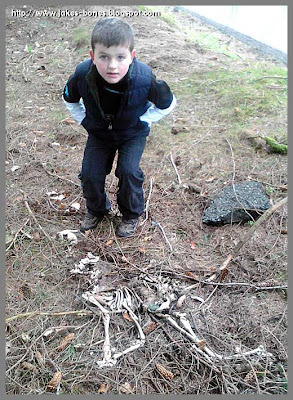 All the bones lay just as they did when he died, so he hadn't been pulled apart by foxes. Lots of his bones were broken, and his skull was crushed. 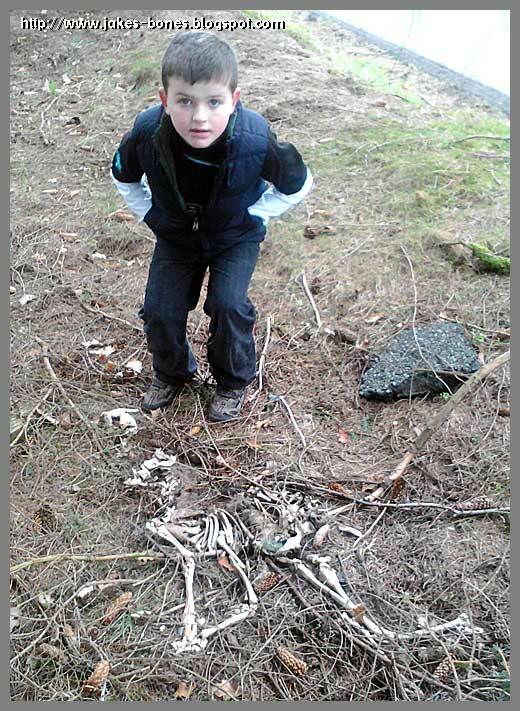 This was only the second roe deer skeleton I found. Until they are about a year old, baby roe deer follow their mum about. Maybe the mum crossed the road, and the baby wasn't quick enough. ↑ I found this red deer skeleton in February, at the side of the road just outside my village. It was a bit of a puzzle, because we mostly only found half of the bones. I think this because a lot of the bones were just buried and we couldn't find them. This was an adult deer hind. The other puzzle was why the red deer was down there. The nearest herds of red deer live about a mile away, and they don't come that close to the village. My friend the gamekeeper said that deer love to eat salt, and sometimes they stand on the road and lick the salt that is put down on the road to stop the ice. It was really odd that we didn't see the body, though, while it was rotting down. 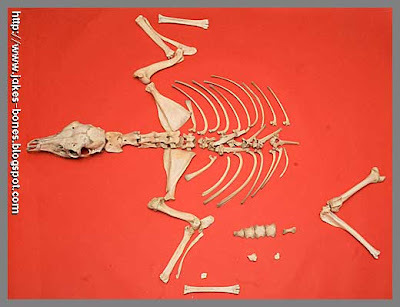 Not many of the bones were broken, apart from the ulna on the front left leg. When deer get killed on the roads, usually the council move the bodies. 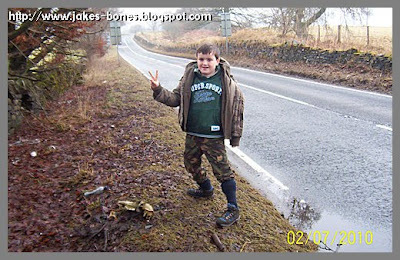 If you're looking for bones, a good place to look is at the side of country roads when there are woods on both sides. If you are drive a lot where there are deer, this is what the AA say about driving safely. There's even a special website about deer on roads.